HOUSTON, Texas – Congressman Beto O’Rourke campaigns on government accountability and removing special interests from politics, but what many voters don’t know is that in 2013, according to LegiStorm, he disregarded a House Ethics Committee directive not to participate in Initial Public Offerings (IPOs), in violation of the Stop Trading On Congressional Knowledge Act (STOCK Act). In 2013, the House ethics committee issued a memorandum warning to Members of Congress that they should not participate in initial public offerings, since those transactions are generally not available to the public and would violate the STOCK Act. Specifically, the memo warned against Members participating in the IPO of Twitter. 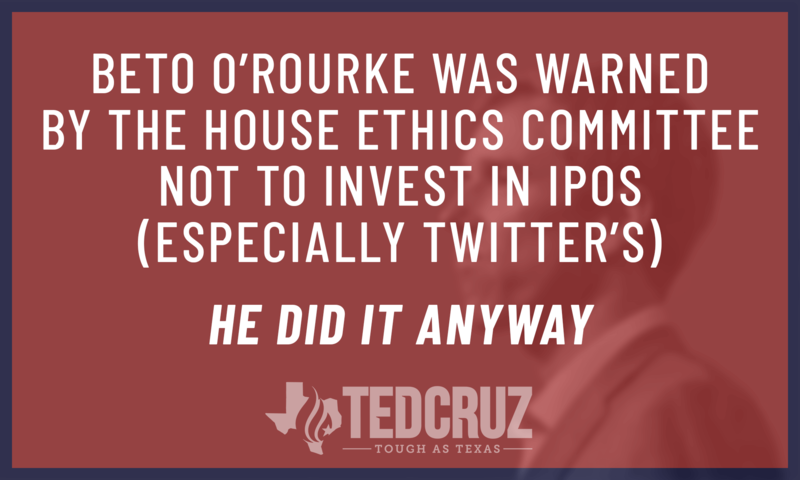 Despite this warning, Beto O’Rourke participated in multiple IPOs, often buying and selling on the same day as the public offering – including buying shares of Twitter, Inc.
On November 7, just two days after the House Ethics Committee memo specifically warning Members against the hotly anticipated Twitter IPO, O’Rourke purchased 100 shares of Twitter. Despite the House Ethics Committee’s instruction that Members check with the Ethics committee before participating in certain transactions, only after LegiStorm called O’Rourke’s office to question the IPO transactions did O’Rourke contact the Ethics committee. After O’Rourke reported himself, the Ethics committee instructed him to return the full amount of the profit – totaling $7,136 – to the U.S. Treasury by overnight mail.